I love water. I don't care if it's a river, sea or bay. Okay, I do prefer sea, but bay is good, especially when the tide is in. 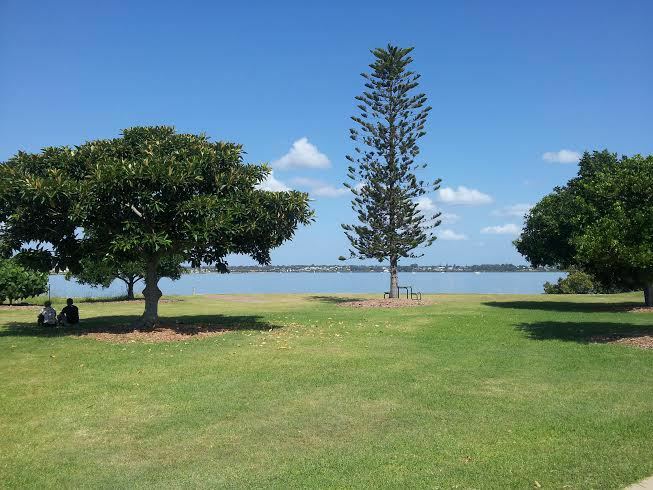 Cleveland Point is surrounded by water - a pretty little peninsula jutting out into Moreton Bay. 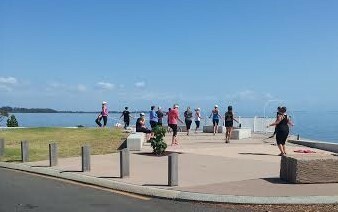 A beautiful day at Cleveland Point. Personally I can take or leave exercise and mostly I leave it, but I noticed wise and fit people skipping and seeming to enjoy it right there by the water. A gentle walk around the path will suffice for me. When the tide is out you can walk out and look for things in the mud - your children will find it fun. 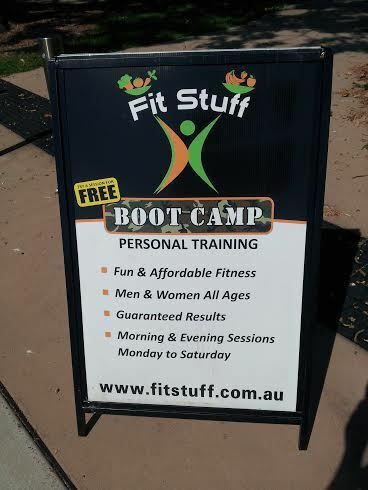 If fitness is your thing. The Lighthouse Restuarant is a Restaurant/Bar/Cafe/Takeaway. I have stopped buying Spinach and Feta anything because they are always disappointing ... often filled with nasty grey sludge. 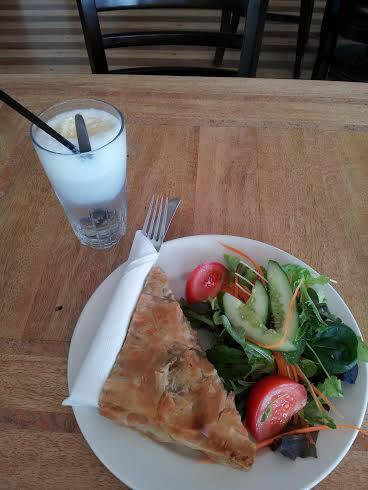 I was therefore was delighted to see in the food display a fat spinach and feta slice with real food inside. The friendly waitress asked if I would like salad. Upon hearing that it was only $2 extra I said 'Why not'. $2! I expected a limp leaf of something bitter and inedible, a wedge of tomato and a sliver of carrot. Look a the photo. I was in heaven. 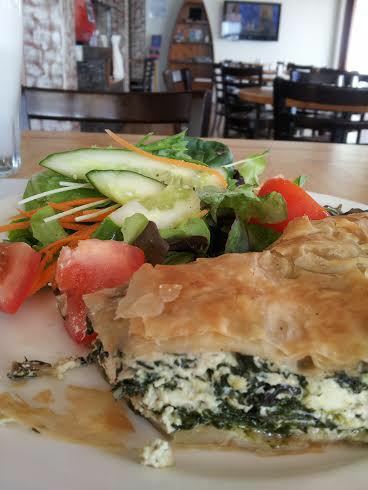 Delicious green spinach and soft white feta ... yum! And the salad - fresh crisp leaves, chunks of tomato, longs straws of crunchy carrot. Heaven! The last time I had anything so delicious it was homemade. There were lots of other fabulous food choices but I didn't look too closely as I was busy obsessing over my spinach. I did notice that the prices in the cafe were reasonable, the staff were friendly and the place was spotless. 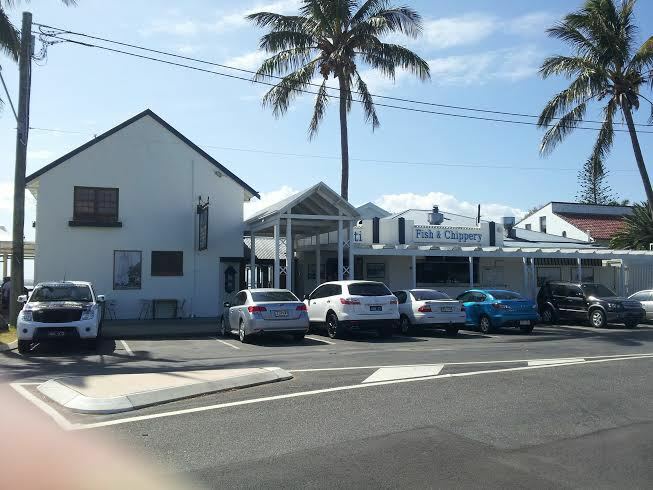 The Fish and Chippery has just the right food for the water's edge. 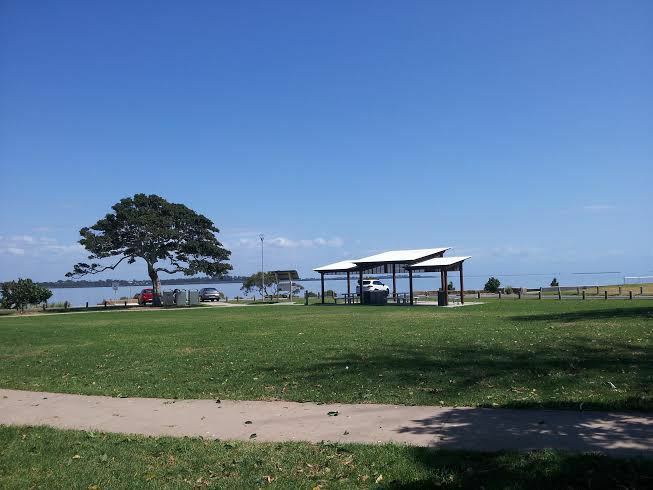 I used to bring my mum here for a fish and chip lunch and we'd sit under the shady trees and reminisce about the many, many family picnics we had here in the sixties. Fish and Chips are a must by the Bay. 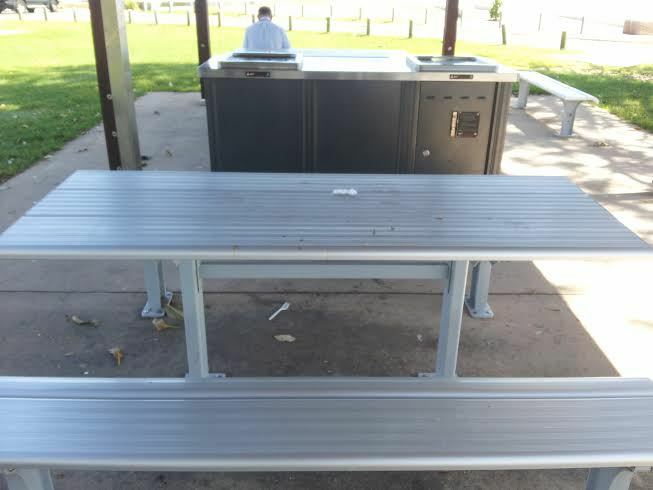 There are clean, new metal picnic tables if you want to be civilised, lots of gas barbeques and a toilet block. No more grotty wood. New picnic tables. 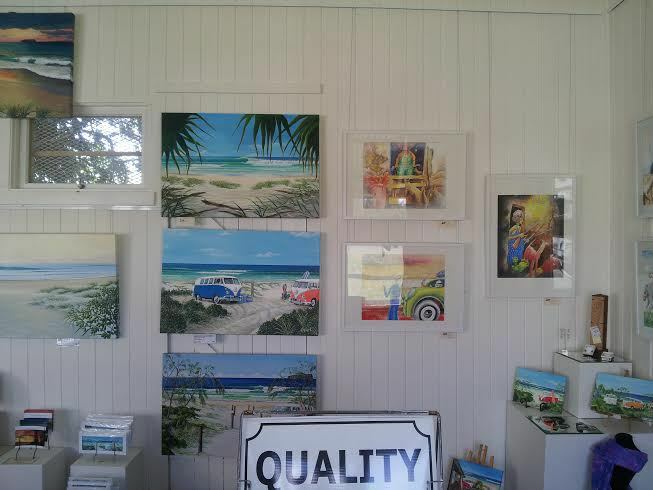 If it is Friday, Saturday or Sunday, you could call in to The Old School House Gallery on the way there or back. There are lots of bright cheerful art works there. At the moment there are some really lovely bird paintings. I was greatly tempted by one of the beach scenes. Sea scenes at The Old Schoolhouse. A great new playground will entice younger family members. It would be a wonderful place to update you family photos. A lighthouse makes a nautical backdrop and there is cool turtle that would love to be in your photos. 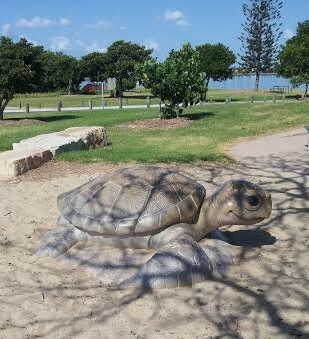 Take advantage of a turtle photo op. Take a book, a rug, a hat, swimming gear and do nothing. Have a mini holiday away from the real world. It's like being on an island if you turn your back to the road. It's hard to believe you're only a half hour from the CBD! 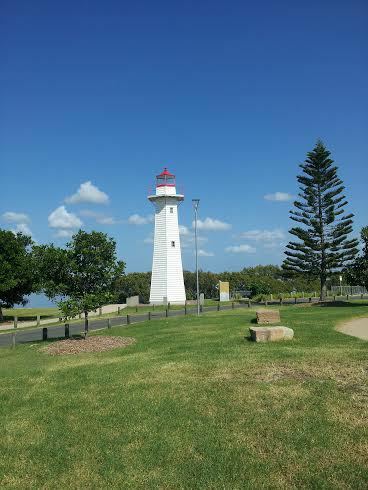 I must get to the Lighthouse Restaurant next visit to Bris. Thanks for the good write up, Lynne.